Cats are boarded in a separate building from the dogs. $12 per day. 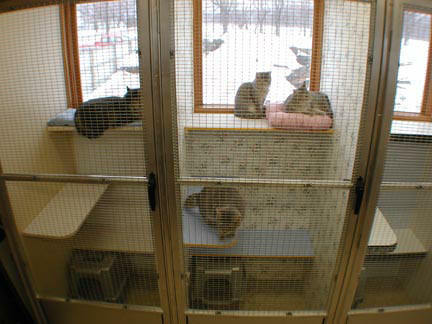 If you have more than one cat and would like them boarded together in one of our suites, it is $12 per day for the first cat and $8 per day for each additional cat staying in the same suite. All cats are required to have Rabies & the Booster (FVRC-P) vaccines up to date. You may have your veterinarian fax us a copy of the latest shot records to (269)375-2851 or you may bring in a copy. We do not except the check off style booklets as proof of vaccines.